1. By the fire: GOD is a CONSUMING FIRE, so the devil is disguising himself as GOD! 2. By the smoke: What is the smoke? It's a smoke screen, lies. 3. By brimstone: It's not the ROCK we stand on, its death, the false rock. Brimstone is also symbolic of judgment. And how do we know that it's all about deception? Because this came out of their mouths. No one spits fire and smoke and rocks out of their mouth. Also, it's their souls that are killed because they worship satan when they fall for the deception. The book of Revelation describes what will happen to bring about the end of this age. There are seven trumpets, more commonly called the seven trumps. A trumpet signals an action or event. These trumpets happen in succession and each action or event sets in place the next required element to finalize the structure and events that bring about the end of the age. Verse Revelation 9:1 is the sounding of the fifth trumpet. At this trump, a star falls from Heaven. As shown in the book of Job, GOD calls HIS children stars. Since this star falls from Heaven, we know this child of GOD must be an angel. This angel has the key to the bottomless pit, so it is an indication that something major is about to happen. Revelation 9:2 And he opened the bottomless pit; and there arose a smoke out of the pit, as the smoke of a great furnace; and the sun and the *air G109* were darkened by reason of the smoke of the pit. Revelation 13:8 And all that dwell upon the earth shall worship G4352 him, whose names are not written in the book of life of the Lamb slain from the foundation of the world. From G4314 and probably a derivative of G2965 (meaning to kiss, like a dog licking his master’s hand); to fawn or crouch to, that is, (literally or figuratively) prostrate oneself in homage (do reverence to, adore): worship. The sun being darkened, meaning a depressed state of not being able to see the light (TRUTH) by reason of the darkness (DECEPTION), and the deception being so great that those who are unknowing mistakenly accepting the deception as the true light. When JESUS returns, HIS Glory will outshine the sun. The devil’s deception is so dark and twisted that he will have people thinking that he is the true light. Think of the negative of a photo; when you stare at the dark image in the negative and then look away, the image gets inverted in the mind and appears white. The lies are so thick, just as when you see smoke from a great fire. But this air that the smoke darkens is not the atmosphere. It’s the spirit; as in the breath of life spirit that is in each individual body, the spirit that is inside us. It’s the same spirit as in the breath of life that GOD breathed into man and man became a living soul (watch the video “Disproving The Rapture” for a comparison of the meaning of the word “air” when it is defining the spirit versus when it is defining the atmosphere. So what is it that will be darkened by the smoke from the pit? It’s the spirit that will be darkened, or obscured by those lies. Revelation 9:2 And he opened the bottomless pit; and there arose a smoke out of the pit, as the smoke of a great furnace; and the sun and the air G109 were darkened by reason of the smoke of the pit. From ἄημι aēmi (to breathe unconsciously, that is, respire; by analogy to blow); air (as naturally circumambient): air. Compare G5594. Revelation 9:3 And there came out of the smoke locusts upon the earth: and unto them G846 was given power, as the scorpions of the earth have power. From the particle αὖ au (perhaps akin to the base of G109 through the idea of a baffling wind; backward); the reflexive pronoun self, used (alone or in the compound of G1438) of the third person, and (with the proper personal pronoun) of the other persons: her, it (self), one, the other, (mine) own, said, ([self], the) same, ([him, my, thy]) self, [your] selves, she, that, their (s), them ([selves]), there [at, by, in, into, of, on, with], they, (these) things, this (man), those, together, very, which. Compare G848. The locusts will turn the backbone of those that do not know TRUTH to mush, and serpents deceive. If you look at Revelation 12, you will see when JESUS saw satan fall as lightning from Heaven. It’s during the hour of temptation. But we, the election, have power to tread on serpents and scorpions. JESUS gave us that power. The hour that JESUS rejoiced in was the hour of temptation when satan was cast out. 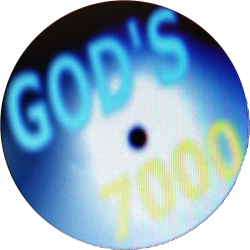 The babes that FATHER revealed these things to, are the little ones; GOD’S seven thousand, the very elect. This is another confirmation that they cannot hurt us; not a hair on our heads will perish. That they should not hurt the grass, neither any green thing, neither any tree means they are not insects. We know from the book of Joel that these locusts are men. It’s the locust army. Revelation 9:4 is where GOD commands them that they cannot hurt HIS election. The Seal Of GOD is TRUTH. If you have eyes to see and ears to hear, then you understand GOD’S WORD. You are not blinded. This is given for GOD’S election. Where do you keep your knowledge? In your brain, and your brain is in your forehead. If you know GOD’S TRUTH, then you have The Seal Of GOD in your forehead. The opposite of knowing TRUTH would be lies. If you have lies in your forehead, then you have the mark of the beast in your forehead. Those of us with The Seal Of GOD in our forehead are to be delivered up for a testimony against satan (at least some of us). At that time is when THE HOLY SPIRIT Speaks through us and all who hear us will hear us in their own language as it is written in Acts chapter two and the book of Joel. Revelation 9:5 And to them it was given that they should not kill them, but that they should be tormented five months: and their torment was as the torment of a scorpion, when he striketh a man. They cannot kill those without The Seal Of GOD in their foreheads, but only sting them as a scorpion would sting. That means melt their backbone to mush for the false messiah. If they cannot kill those that are deceived, then it’s clear that they cannot hurt the election. This should make it clear that being delivered up to death means being delivered up to satan (that is one of satan’s names). But yet, they cannot harm a hair on our heads. Luke 21:16 And ye shall be betrayed both by parents, and brethren, and kinsfolks, and friends; and some of you shall they cause to be put to death. Be patient and wait for the TRUE CHRIST. Possess your soul, don’t give in to them. If you give in to them, you may lose your soul. In Daniel 9:27, it is stated that the devil will confirm a covenant with many for one week. In the book of Daniel, it speaks of time in weeks of years. So one week is equal to seven years. This means that the great tribulation is supposed to last for seven years, but in Matthew 24:22 JESUS says that this time will be shortened for the elect’s sake. Revelation 9:5 shows that this time is shortened to five months. Five months is the time of the locust. It’s May through September, from Passover to the Feast Of Tabernacles. It’s interesting that this is the same length of time as was the flood of Noah. So as it was in the beginning, so shall it be at the end. Even though this information is given, still be careful and watch. We are watchmen, we are supposed to watch. At the end of the five months, the TRUE CHRIST will return. Those that have fallen away to satan will wish for the rocks to fall on them rather than facing the wrath of The LAMB. Revelation 6:17 For the great day of his wrath is come; and who shall be able to stand? Revelation 9:7 And the shapes of the locusts were like unto horses prepared unto battle; and on their heads were as it were crowns like gold, and their faces were as the faces of men. The way the locust army is organized would be as when horses are in battle array. They have special type of turbines that indicate they are very rich. These crowns also indicate that they claim to be royalty. They claim to be GOD’S very own, but they are actually satan’s best lieutenants. There faces are as the faces of men because they are men. Revelation 9:8 And they had hair as the hair of women, and their teeth were as the teeth of lions. They are soft as a mother would teach her child. But their deception can rip and tear your soul like a lion without you being aware of it. There is a deeper understanding to this information that I may post a study on at a later date. These breastplates are symbolic of the fallen ones. They are not the breastplates of a Levite priest which has twelve stones. The chariots are similar to the chariots described in the book of Ezekiel. Just as GOD used one of these chariots to carry HIS THRONE, these fallen ones will have their chariots for their purposes. Revelation 9:10 And they had tails like unto scorpions, and there were stings in their tails: and their power was to hurt men five months. Written again for emphasis, these stings in their tails work to paralyze those that do not know TRUTH, while their backbone is turned to mush for the false messiah. Again showing that their power is to hurt men five months. Their king is the devil. The name is given in two languages with the same meaning in each language. There is no mistaking the identification of this angel. The name means destroyer, which is one of satan’s names. In the Hebrew, the name means destroyer, but in the Greek, the name means destroyer, but can also mean one that perishes. Another of satan’s names is the son of perdition. There are three woe trumps, numbered five, six, and seven. At the fifth trump, the locust army begins to swarm. At the sixth trump, satan is cast to earth as antichrist, and at the seventh trump JESUS returns. It’s woe unto all those that don’t know the TRUTH and as a result, fall away to satan. The four horns of the golden altar which is before GOD signifies the Power of GOD’S Altar. The Euphrates is the border between Babylon and Israel. This is also when the false messiah appears on earth. When the “third part” is mentioned, it means a deception, just as when the dragon drew a third part of the stars of Heaven with his tail in Revelation chapter 12. These men are slain by deception. To be slain by deception means they are deceived into following antichrist and are Spiritually dead. In verse Revelation 9:5, above, remember that they cannot kill those that do not have The Seal Of GOD in their foreheads. So they cannot kill these that are slain. This means that it is their soul that is slain, not their flesh body. If they don’t repent while they are still in the flesh, they will have to go through the Millennium. The phrase, “an hour, and a day, and a month, and a year” is an idiom and means prepared for a set time. The alarm was set and the countdown began long ago. The locust army is very large, and their king is satan. But this is allowed by GOD. It is GOD’S great army that HE sends among HIS people, as written in the book of Joel. GOD is in control, and everything happens according to HIS plan. There is a deeper meaning to this army. For example, information on the heads of the horses can be obtained by understanding the teachings of the churches of Smyrna and Philadelphia in Revelation 2:9 and 3:9. 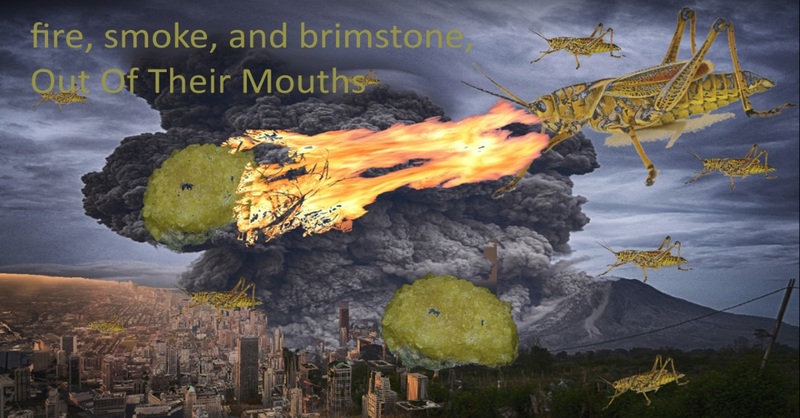 Revelation 9:18 By these three was the third part of men killed, by the fire, and by the smoke, and by the brimstone, which issued out of their mouths. When we look at GOD’S creation, we know that GOD always designs things in a natural way. We know that the beast of Revelation 13 is a governmental system with seven heads and ten horns. The heads are kings that lead up to the beasts final state. The horns signify power and are representative of fallen angels. The book of Revelation is given metaphorically, by models or types for GOD’S election to understand. There is no such thing in nature as a creature with seven heads. You may see a creature with two heads, but that would be a mutation and not a natural creation. As you see from verse Revelation 9:18, the third part (deception) of men were killed. They are Spiritually killed by the deception. Not knowing the TRUTH, and as a result falling away to satan means they will have to go through the Millennium. And how were these men killed Spiritually by deception? Our GOD is a consuming FIRE. The devil comes and deceives the world into believing he is GOD by his fake fire. As you saw earlier in this study, the air that is darkened is not the air as in the atmosphere, but is the breath of life spirit. They obscure the TRUTH. They deceive. It’s a smoke screen. They are blowing smoke (lies), deception. Brimstone is symbolic of judgement. And these three proceeded out of their mouths. You can see that it is deception. There is no such creature that spits fire, smoke, and rocks out of its mouth. It’s not CHRIST, our ROCK. It’s satan, the false rock. It’s the power to deceive. Even their behind the scenes actions of their deception is the deception of serpents. The hurt they cause is the destruction of souls. The beast is a one world system government. You cannot buy or sell unless you join satan’s system. All idol worship is a type of satan worship. If you do not know the TRUTH, you will think that satan coming in peacefully and prosperously and bringing peace, and putting a chicken in every pot is a good thing. You will think he is good because he disguises himself as an angel of light and deceives by performing miracles on the earth in the sight of men. Even though this world is full of evil, and people do murder. Convincing others to follow satan would be murdering their souls. Sorceries are directly related to pharmaceuticals (drugs) and witchcraft. By being a part of satan’s system, these people are committing idolatry. Fornication and adultery is the physical model by which cheating on CHRIST is compared. They help build satan’s kingdom by the works of their hands. Before the True Bridegroom appears, The Bride has already been impregnated with satan’s lies and worshiped satan. They have stolen the TRUTH from unsuspecting believers. JESUS will say: Depart from ME, I never knew you.